Iselle 5-day track 7 a.m. HST Wednesday, Aug. 6, 2014. Image courtesy CPHC/NOAA/NWS. At 5 a.m. on Wednesday, Aug. 6, Hurricane Iselle was located 710 miles ESE of Hilo, and 820 miles ESE of Kahului, Maui. The system was moving WNW at 15 mph, and has maximum sustained winds near 85 mph, making it a Category 1 hurricane. Forecasters with the National Weather Service say outer winds from the storm and heavy rains may begin affecting the Big Island of Hawaiʻi by Thursday afternoon, and spread to the rest of the state on Thursday night and Friday. Satellite imagery of Iselle at 8:30 a.m. HST, Wednesday, Aug. 6, 2014. Image courtesy CPHC/NOAA/NWS. The system is forecast to bring heavy rains, high surf and strong winds to the state, with tropical storm conditions reaching Maui County late Thursday. The latest forecast is for sustained winds of 40 mph or higher for portions of Maui County from Thursday night to late Friday morning. Depending on the exact track of Iselle, there is a possibility of moderate wind damage. An “astronomical high tide” is also expected, according to the National Weather Service. 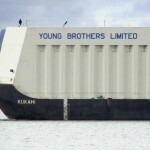 The agency is forecasting a high tide Thursday for Hāna in East Maui that is 2.7 feet at 1:42 p.m. and 2.9 feet at 2:18 p.m. on Friday. Forecasters say the high surf and high tide combination will bring the potential for coastal flooding along low lying areas. Tropical Weather Outlook. Image courtesy NOAA/NWS/Central Pacific Hurricane Center. 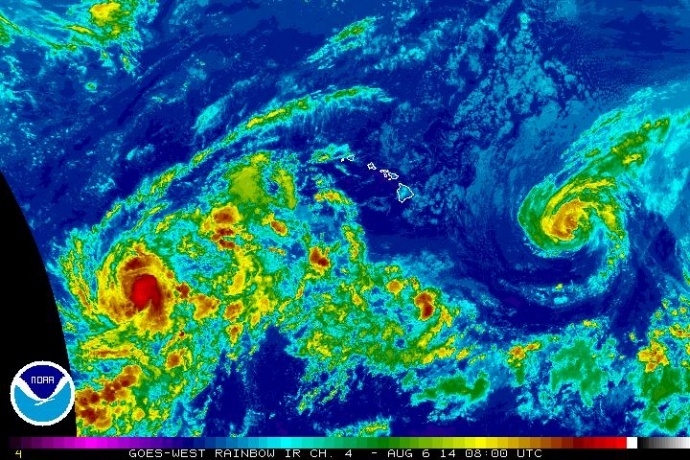 Hurricane Julio, which is on the heels of Iselle, is forecast to impact the Hawaiian Islands on Sunday. Julio was still located 1645 miles ESE of Hilo and 1740 miles ESE of Kahului, Maui at 5 a.m. on Wednesday, Aug. 6, 2014, and had maximum sustained winds near 75 mph. The state Dept. of Education has also issued an advisory indicating that all public schools in Maui County (Maui, Molokaʻi, Lānaʻi) will be closed on Thursday, Aug. 7. The schools in Maui County that are designated emergency shelters will remain closed on Friday, Aug. 8. Other school closures will be determined by the DOE as the situation develops. Designated school shelters will open to the public at 1 p.m. on Thursday, Aug. 7. The school shelters include: Baldwin High (Wailuku); Lokelani Intermediate (Kīhei); Kekaulike High (Upcountry); Hāna High & Elementary; Molokaʻi High; and Kilohana Elementary (Molokaʻi). 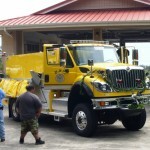 An additional shelter at Lahaina Civic Center is expected to open at 1 p.m. on Thursday. Maui Bus Paratransit Service will be available for same day reservations from home to shelter by calling MEO at 877-7651. Securing loose objects in your yard and around your home that could potentially turn into flying debris. Stocking up on food, water and medicine. The new recommendation by the state is to have SEVEN DAYS worth of supplies. Boarding up or covering windows. Bringing your disaster kit with you if you are required to evacuate to a designated shelter. Securely mooring or moving boats to a designated safe area well before the storm hits. Continuing to monitor the news for storm updates from the weather service and Maui County advisories. Hurricane Iselle is now listed as a Category 2 hurricane with maximum sustained winds of 100 mph, according to the latest forecast issued by the Central Pacific Hurricane Center. 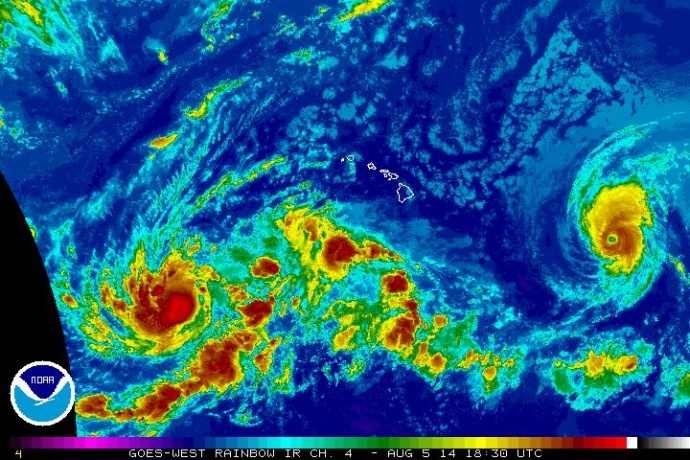 Agency forecasters say there is some weakening forecast over the next two days, and Iselle may become a tropical storm by Thursday as it approaches the Big Island of Hawaiʻi. 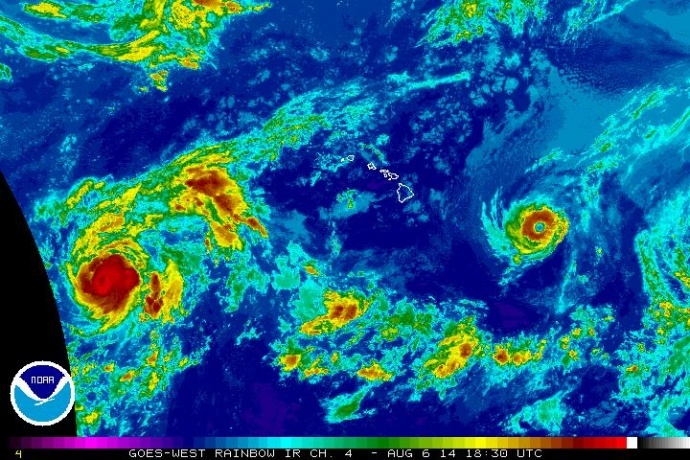 At 8 p.m. on Tuesday, Aug. 5, 2014, agency forecasters said Iselle was located 855 miles ESE of Hilo, Hawaiʻi; 965 miles ESE of Kahului, Maui; 1015 miles ESE of Kaunakakai, Molokaʻi; and 995 miles ESE of Lānaʻi City. Satellite imagery of Iselle at 10 p.m. HST, Tuesday, Aug. 5, 2014. Image courtesy CPHC/NOAA/NWS. The system was moving WNW at 13 mph, with the center of the system expected to approach the Big Island of Hawaiʻi on Thursday afternoon. Hurricane force winds currently extend outward from the center up to 30 miles, and tropical storm force winds extend outward up to 115 miles. County officials say the latest models show Iselle reaching Maui County Thursday night as a tropical storm. However, right now the system is still classified as a hurricane. Iselle 5-day track 5 p.m. HST Tuesday, Aug. 5, 2014. Image courtesy CPHC/NOAA/NWS. “Even if Iselle weakens to become a tropical storm it will still bring high surf, strong winds and heavy rains. Coastal flooding is also possible as high surf begins to rise along east facing shores as early as Wednesday,” county officials said. In anticipation of Iselle, the National Weather Service issued a flash-flood watch for the state that goes into effect on Thursday, Aug. 7, at 4 a.m. until Saturday, Aug. 9 at 6 a.m.